HARRISBURG – Surrounded by friends and family, Rep. Karen Boback (R-Lackawanna/Luzerne/Wyoming) took the oath of office today for her sixth term in the Pennsylvania House of Representatives. “I am honored to once again serve the people of the 117th Legislative District, and I look forward to working with my colleagues in a bipartisan manner to move Pennsylvania forward,” said Boback. Boback will continue advocating for Pennsylvania’s children and seniors. She has recently initiated a focus on medication diversion – one aspect of the complex prescription drug abuse epidemic gripping the Commonwealth. “There are many diverse issues facing our local communities which require cooperation and innovative thinking. I am committed to doing all I can to ensure Pennsylvania remains a wonderful place to live, work and raise a family,” Boback added. For more legislative news, go to RepBoback.com or Facebook.com/RepBoback. Rep. Karen Boback was sworn in today for her sixth term, representing the 117th District in Lackawanna, Luzerne and Wyoming Counties. 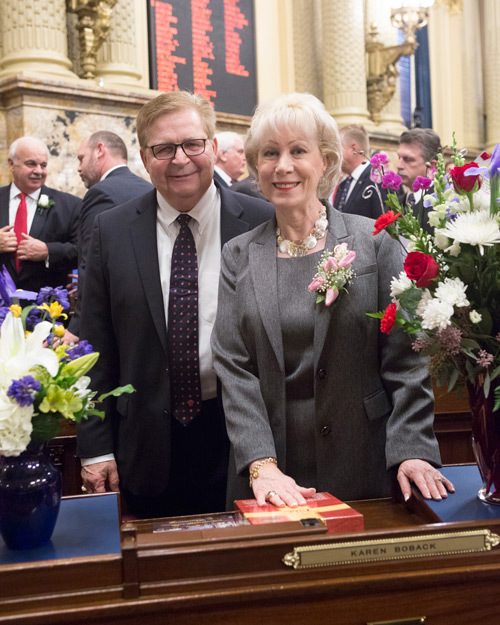 Boback is pictured with her husband, Bernard J. Boback, Jr. Today’s ceremony marked the opening of the 201st General Assembly.